Flash your way ahead of the competition with one of the best selling cheer shoes from Nike. While cheering on your team from the sidelines or competing for a competitive win, the Nike Cheer Flash will be sure to get you noticed. The sleek low-profile design on the Nike Cheer Flash is sure to provide maximum support and durability for you to perform your best whether it be on the sideline or at a competition. The upper is constructed of a synthetic and leather material. The midfoot strapping in addition to the construction of the upper provides superior midfoot support. The midfoot support is important for stunting and tumbling. The Nike Cheer Flash tends to fit fairly true to size if you like a snug fit. If you have a wide foot and would like some additional growing room, please consider going up 1/2 size. Of course, these are just recommendations and not a guaranteed fit. I love these shoes, they look so comfortable and supportive for tumbling and to have a good grip when stunting. They do have good grip on them. 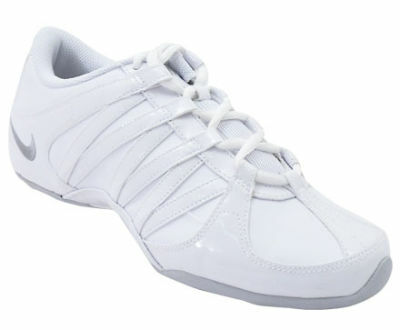 Nike did a great job when they made this cheer shoe.